Looking for a one-stop shop on all matters relating to health and wellbeing? Consumer Health Complete offers you a comprehensive range of quality information on topics including men’s and women’s health, fitness, diet and nutrition, aging, heart health and much more. Aimed at the general reader and patients, this resource provides access to journals, books, encyclopedias and pamphlets written in plain language, supported by images, videos and diagrams. Coverage includes a range of perspectives from mainstream medicine to holistic and complementary approaches. Consumer Health Complete aims at making searching easy. Why not start with a basic keyword search? Just 3 steps and you're on your way with results harvested from a range of sources. Select the Home tab, type your terms into the Find box, then hit Search. Simple. The alternate Advanced Search option allows you to refine your searching by applying limiters such as date range and publication type. There's also the added convenience of searching the database in a range of languages. 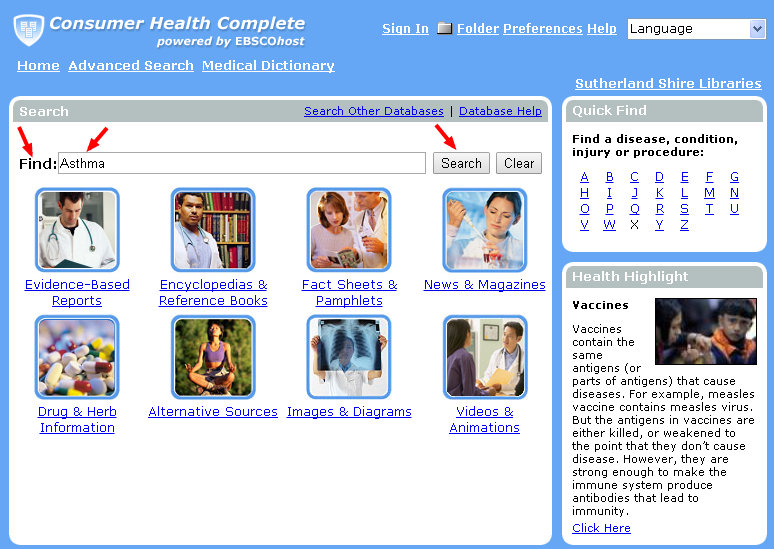 Consumer Health Complete provides great additional features such as Merriam-Webster's Medical Desk Dictionary at your fingertips and the option to print, email or save your search results to a personal folder. You can browse Popular Sources or opt for Quick Find giving easy access to information on common illnesses, injuries and medical procedures. Also included is the Health Highlight feature keeping you informed on a variety of popular health topics. Like to know more? Why not take the online Tutorial showcasing what Consumer Health Complete can offer you. With easy online access, good health starts here. Please contact your Library for further information on this fantastic resource.